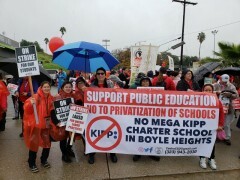 LA: Day 3 of teachers strike marked by rallies and street shutdowns | Fight Back! Los Angeles, CA - On day 3 of the UTLA teachers strike, seven regional rallies were held citywide, resulted in major street shutdowns. In East LA, East Area UTLA teachers held a loud enthusiastic rally at Soto Street in front of the LAUSD East Area offices. The rain did not put a damper on the loud, enthusiastic teachers and community supporters numbering in the thousands. Led by a MECHA student speaker who called on all students to support UTLA by joining picket lines, the rally was inspiring. Teacher speakers called this a historic strike that will be remembered and paid homage to Chicano and Black civil rights activists like Dolores Huerta and Rosa Parks. Adrian Tamayo, director of UTLA East Area led chants like “Whose schools, ours schools!” Vice President of Elementary Education Gloria Martinez gave a passionate speech on the dedication and sacrifices teachers willingly make for the students and community. Martinez also said UTLA was disrespected by the latest inaccurate comments and false information made by LAUSD board members and Superintendent Austin Beutner. Beutner and the others attempted to confuse parents into returning the students to school. The UTLA strike at LAUSD, which is the second largest school district in the nation, has led to massive student absences and massive teacher participation. With over 300,000 student absences, the successful strike is putting extreme pressure on LAUSD. The strike has overwhelming support in Southern California area as well as national backing from labor unions, celebrities and many politicians. In the remaining two days of the first-week strike, UTLA has called for more actions, including another mass rally on Friday, January 18, in front of LA City Hall. Centro CSO members will continue to picket daily at Breed Street School and encourage all to express solidarity with the striking teachers, support-staff, students and parents.